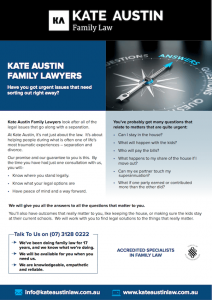 As accredited specialists in Family Law, Kate Austin Family Lawyers are in a great position to provide guidance for you in relation to the rights and responsibilities associated with spousal maintenance in Australia. Often following a separation or marriage breakdown, one party is left in a very difficult financial position if financial support is suddenly cut off by the other party. In many marriages and relationships, there is still a main breadwinner and a separation can result in the other party having insufficient income to meet their own needs and costs essential for day to day living. Spousal maintenance can be a way of alleviating the pressure caused by the breakdown, particularly in the short term, when mortgage repayments or rent, and other bills still have to be met following separation. It can be obtained to help relieve financial pressure pending an overall property settlement being resolved, and it can also be sought in appropriate circumstances for a longer period of time. Spousal maintenance is the payment of money by one former spouse or partner to the other. It can be made by way of regular monetary payments, say week to week, or by way of a lump sum. It can also comprise payments to a third party, such a bank for mortgage repayments, or an insurance company, for health insurance. 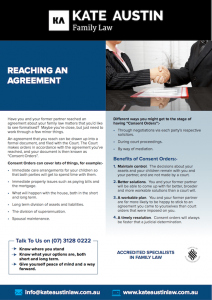 It is different to a property settlement though in many circumstances, spousal maintenance is sought as part of overall property settlement proceedings, often as an interim and temporary measure so that one party is able to cover their day to day expenses pending an overall property settlement being finalised. In other countries, this is known as alimony or an allowance, however in Australia, we refer to it as spousal maintenance. How can I obtain spousal maintenance? Some parties reach an agreement about the payment of spousal maintenance, and this can be formalised into a court order. Otherwise, a court can make an order for the payment of spousal maintenance, either as part of property settlement proceedings or as an isolated application. Who is entitled to spousal maintenance? For any other adequate reason, for example, commitments necessary to support themselves and their children, family income and resources. Maintaining a standard of living that is reasonable having regard to their particular family. 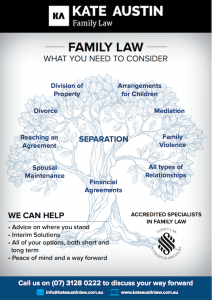 If you need advice about financial issues following a marriage breakdown or separation, as family law accredited specialists, we can give you advice about eligibility, or liability for spousal or partner maintenance. Particularly pending an overall property settlement being determined, spousal maintenance can be very important for your situation. We can clarify what partner or spousal maintenance is all about, and give you advice about what you might be entitled to or when you might be liable to pay. We will explain the process and work with you. For more information, or to specifically discuss the issue of spousal maintenance, please give us a call.